Apart from standard intermediate bulk containers (IBC’s) we also have Repaltainers. Invented by Mauser in 1991 when the use of recycled plastic became a priority. This IBC is a 1000 L composite IBC with a pallet made from recycled plastics and is the most robust IBC of them all. 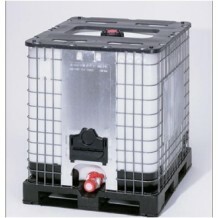 Because this IBC is tried and tested for multi-trip use and is re-usable even under the most extreme conditions this container remains highly valued up until today. It can resist high levels of mechanical stress and all parts are exchangeable and therefore better for reconditioning. At Delta Containers we have been reconditioning these containers for many different industries such as chemicals, pharmaceuticals, cosmetics and many others. If they have a closed-loop with their clients we clean the tanks for them before they go back to the manufacturer to refill them for the customers. Example: The chemical producer fills the repaltainer and delivers it at the customer, they use the product/chemical and once empty we collect the repaltainters to recondition them and deliver them back at the chemical company for them to refill them again for their clients. These repaltainer tanks are UN approved and due to our state of the art cleaning equipment and leak testing systems we can certificate these repaltainers as UN-approved which is very important for many industries. If you have a closed-loop ongoing distribution with one of your clients and you’re interested in learning more about the repaltainers or our reconditioning process, please don’t hesitate to call our office and we are more than happy to supply you will all the necessary information specific to your industry or products. We have a standard range of best-selling IBC covers on our website that are suitable for any 1000L IBC container. They all have easy handling features to make it easy to tighten them around or over the IBC and to access the valve and lid.